Carnivorous plants, such as the Venus flytrap, made famous in the 1986 film “Little Shop of Horrors,” don’t thrive in New York City flower shops. In fact, Venus flytraps are only native to a small area that straddles the border between North and South Carolina. But, like their carnivorous cousins, such as butterworts, sundews and pitcher plants, they are falling victim to habitat loss. There may be fewer than 40,000 Venus flytraps left in their native habitat, according to the National Wildlife Federation. Across the United States, including here in Rhode Island and Massachusetts, the preferred habitats of carnivorous plant species — acidic bogs and wetlands — are being filled in and built upon. Two of the more prevalent insect-eating plants that can be found in New England are round-leaved sundew and the North America pitcher. This region’s pitcher plants dine on low-crawling insects such as earwigs and ants; sundews trap mosquitoes, gnats and other small flying insects. Like pollinators and amphibians, carnivorous plants are sentinels of environmental quality. One of the first things to disappear when a bog or wetland degrades is its population of carnivorous plants. These plants, which typically grow in places where the soil is nutrient-poor and have adapted to glean some of their sustenance by consuming insects, spiders, and even rats and mice, are telling us something about current environmental conditions. The message isn’t good, and it’s largely being ignored. Since it’s decidingly easy to destroy carnivorous plant habitat, from filling it in, to draining it, to paving it over, some 95 percent of this sensitive habitat in the United States has been destroyed, according to the NECPS. Much of the habitat that carnivorous plants need to survive is now buildings and parking lots. The nursery industry, which uses sphagnum and peat moss, supports the mining of these natural resources from bogs, contributing to the destruction of a habitat where carnivorous plants once thrived. Typically small and low-lying, many carnivorous species also are being shaded out by taller plants as their habitat is altered by human activity, such as large-scale agricultural operations. Poaching also is a significant threat to rare carnivorous plants. North Carolina lawmakers recently voted to make the theft of Venus flytraps a felony in the four counties there where it grows wild. The round-leaved sundew is another carnivorous plant native to New England.Some preservation attempts, such as the law enacted in North Carolina, are being made, but most efforts — plant rescues, for example — are time-consuming and expensive, and often lead to the protection of just a few fragmented stands of carnivorous plant habitat. The NECPS was founded more than a decade ago by John Phillip Jr., who started keeping these plants on his dormitory windowsill in 1974, when he was an undergraduate at the University of Rhode Island studying agriculture and plant science. The first meeting of the organization was held in January 2003 at the Charles H. Smith Greenhouses at the Roger Williams Botanical Center in Providence. Since then, the 1,000-member NECPS, partnering with such organizations as the North American Sarracenia Conservancy, has been working to conserve carnivorous plant habitat. To engage the public, the NECPS holds various plant shows, including one next month in Salem, N.H. The organization’s 11th annual Fall Carnivorous Plant Show will be held Oct. 4-5 at the Roger Williams Park Botanical Center. The Providence show will feature pitcher plants from Malaysia with traps the size of softballs that are capable of eating lizards and mice. 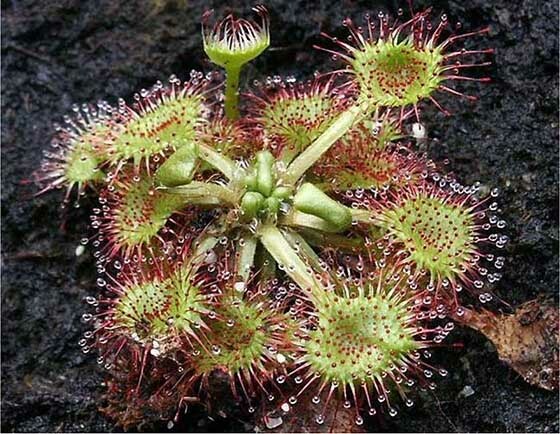 There also will be ever-popular Venus flytraps, sundews from Australia ranging in size from a dime to 12-plus inches high, and hundreds of other carnivorous plants. There are about 630 identified species of carnivorous plants — and another 300 or so protocarnivorous plants that trap and kill insects and/or small animals but lack the ability to digest or absorb nutrients like carnivorous plants. According to the NECPS, there plants use five basic trapping mechanisms: pitfall traps trap prey in cup-like leaves, which fill with rainwater and the digestive enzymes produced by the plant; the leaves of flypaper traps consist of glands covered with a sticky substance that looks like nectar; snap traps suddenly close when trigger hairs are stimulated by an insect; bladder traps have small openings with a door-like structure; and lobster-pot traps capture their prey as they are easy to enter, but difficult to leave. "These are some rare plant species," Sackett said. "We're hoping they don't get obliterated."